Spread the caramel into the pastry base – don’t be tempted to beat it first or it will go runny! Sprinkle a little salt over the top of the caramel. Melt the dark chocolate and evaporated milk together gently in the microwave or in a bowl over a pan of simmering water. Beat until smooth and glossy. Gently spread the chocolate mixture over the caramel base. 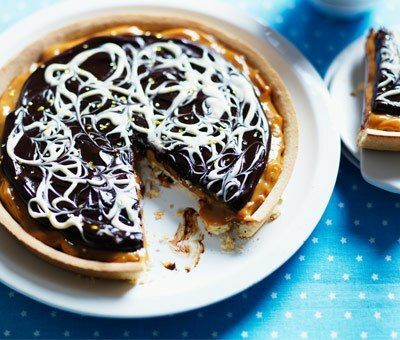 Melt the white chocolate and drizzle with a teaspoon over the top of the tart (or use a piping bag). Use a cocktail stick to swirl the chocolate for a marbled effect then sprinkle with a few gold stars! Im making this for christmas day.where diez the milkyway go?! Hi evapongs, the milkybar is used to garnish the top of the tart. Once it is melted swirl over the top and use a toothpick to marble it into the chocolate filling for extra effect. Hi Jane. Homemade pastry is such a treat! This recipe will work well in an 8" pastry tin. Try to make the pastry case about 2 cm deep. How do you store this if making the day before? Is it ok to keep in the fridge? Hi Pamelam88, This recipe can be kept in the fridge.